As sung by the Irish clown, Johnny Patterson. Have you ever been in love, boys, did you ever feel the pain? I'd rather be in jail, I would, than be in love again. That I met her in the garden where the praties grow. To walk straight through the world without the Grecian bend. 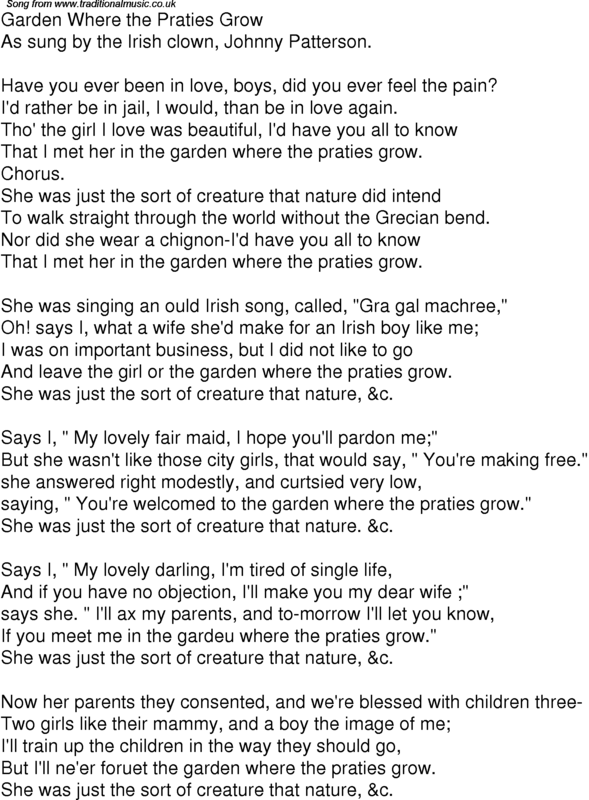 She was singing an ould Irish song, called, "Gra gal machree,"
And leave the girl or the garden where the praties grow. She was just the sort of creature that nature, &c.
Says I, " My lovely fair maid, I hope you'll pardon me;"
But she wasn't like those city girls, that would say, " You're making free." saying, " You're welcomed to the garden where the praties grow." She was just the sort of creature that nature. &c.
And if you have no objection, I'll make you my dear wife ;"
If you meet me in the gardeu where the praties grow." But I'll ne'er foruet the garden where the praties grow.